In the perfect world, bees create neat layers of parallel comb, with a nice even space between them. In the real world, though, things might not turn out that way and we find comb at a strange angles. If our bees then extend that comb it can start encroaching into the vertical space of an adjacent frame, eventually joining the comb on each frame together. Cross comb is comb created by bees that connect two frames. This makes inspecting a hive a risky proposition, particularly when removing frames for observation. As a frame is lifted, the comb can be torn away from either of the joined frames and come crashing down. The existence of cross comb is something to be avoided if at all possible. First, a quick recap on the idea of bee space, which is an important characteristic of where bees build comb. In a nutshell, if bees find a space that is more than 3/8 inch wide they will fill it with comb. If they find a space that is less than 1/4 inch they will glue it with propolis. A space between these two widths will be left alone – that’s bee space. Bee space is an important issue in the design of bee hives, with Mr. Langstroth staking a claim for its discovery in the 1800’s. But in the wild, bees honor bee space as a matter of course. We come along, as beekeepers, with our structured hives, with frames and foundation and ask our bees to start building comb. For the most part they do this in a very orderly manner and combs are built beautifully parallel to each other, with bee space neatly maintained. But bee space and neatness are not the same thing. Bees will maintain bee space but can still make an awful mess, with their comb. Why does cross comb occur? If bees love their bee space so much, why does cross comb occur? Why not just create neat, parallel comb all the time? There are a number of potential reasons. A leaning hive, no matter how subtle, is one of the more common reasons. Gravity plays a big role in how comb is drawn. Get your level out and check your hive to make sure it is absolutely plumb, across all three dimensions. Most common reasons for cross comb is a wonky beehive! Another reason is “just because”. Sometimes you do absolutely everything right, set up the most beautifully-crafted hive and have it as level as the surface of a lake. But if bees want to build comb off at a strange angle for no apparent reason, they will do just that. Cross comb is no problem for the bees! They do this in nature and retain bees space. The issue arises when we humans approach the hive, pull off the top and start extracting frames one-by-one to have a look! Cross comb is a problem only because we choose to regularly inspect frames. 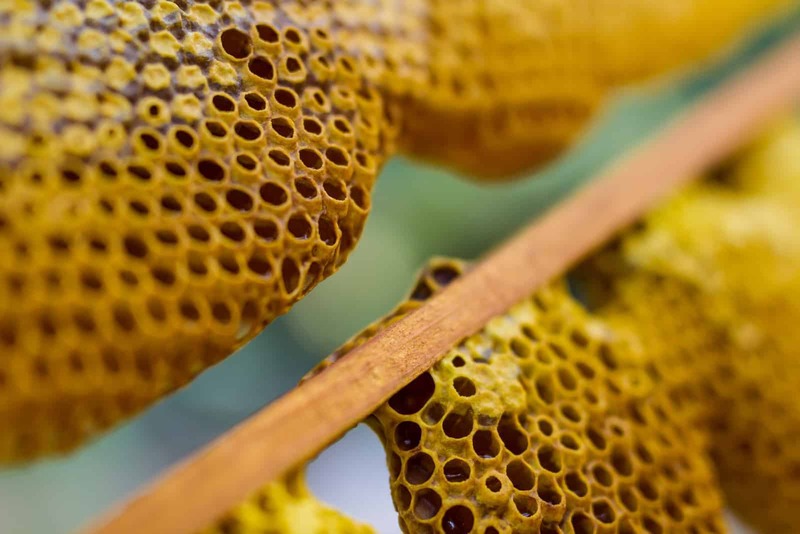 When we do that we run the risk of any cross comb causing significant damage between joined frames, with chunks of comb, complete with honey or pollen or brood, falling off. Until the time that we took out that frame, the bees were living their lives quite happily. It is, of course, a reality that we carry out our inspections. Even if we do them infrequently and with caution, there’s always the chance of damage. So avoiding and fixing cross comb becomes an important task for the beekeeper. Fixing cross comb is a clean up task that helps limit the damage when we disturb our bees. One of the great debates in beekeeping is over the use of foundation. In a previous lesson we looked at the pros and cons of foundationless beekeeping. When bees are left to their own path with foundationless frames, they will generally do a fine job. But small factors can impact the direction of the comb they build. Foundationless beekeeping provides a more free-form environment for the bees. Warre and Top Bar beehives are foundationless by design and so this issue exists for these types of hive. But is is also not uncommon for beekeepers with Langstroth beehives to use foundationless frames. For the new beekeeper, drawn in by the wave of natural beekeeping advocates, foundationless frames are attractive. However, they can create a challenge for the beekeeper, in short order, at the precise time the beekeeper is learning some important lessons. Some beekeepers strike a middle ground. They propose alternating frames with foundation with foundationless frames. This approach allows the foundation to act as a guide for the bees, down to the floor of the box. This can encourage the creation of straight comb. The use of foundation, though, doesn’t entirely solve the problem. 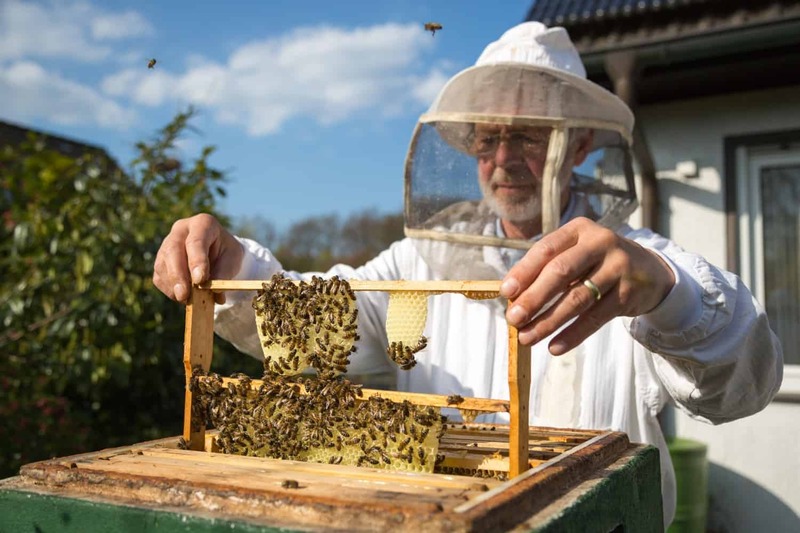 Beekeepers who forego the benefits of foundationless frames, may still find cross comb in their hives, even though the frames have given the bees a pretty big hint! In all cases the beekeeper should inspect for cross comb as a matter of course during inspections. Have you heard us say that prevention is better than cure a few times? Well, the same applies to cross comb. Out-of-control cross comb is a nightmare to resolve and you run the real risk of significantly damaging the comb. It’s far better to address issues as they come up. In the first few weeks after setting up a hive, stay on guard for cross comb. As the summer gets into full swing there’s a big build up of brood, foraging hits a peak and space requirements in the hive grow rapidly. In short, lots of comb is being created. If you avoid cross comb for that period then there’s a good chance you’ve nailed it, in terms of the hive been well set and level. But if you have not got it quite right – and it won’t always be clear to the eye – then cross comb will start to form reasonably soon. Deal with it before it gets out of hand. At this period of rapid growth, check for signs of cross comb frequently and nip it in the bud. The way to do this, if you notice it early enough, is to move the comb back into the correct plane, hanging vertically under the top of the frame. This will sometimes mean making a small, gentle cut at the point where the comb meets the frame. This allows a little more freedom to bend and move the comb back into the correct plane. Then make sure the connection to the frame is good again. Here’s a video of a beekeeper taking a look at his hive and making a few minor adjustments, here and there, to avoid cross comb becoming a major problem. The proactive steps taken by this beekeeper will save a lot of effort later. Truth be told, even the most careful of beekeepers who checks every last detail will find cross comb sooner or later. It is a fact of life for the beekeeper, although steps can be taken to lower the likelihood, as we’ve seen. But if it does get out of hand – beyond a “quick trim” – how can you fix the situation? When the frames have been separated, the comb on either frame can be gentle eased back into the appropriate plane, in the hope the bees will get the message. In other cases, the scope of the cross comb can be much more extensive. In these situations you may need to sacrifice chunks of comb, at least from the frame involved. However, it can sometimes be reused, through rubber bands. This video illustrates how to salvage comb in this way. Sometimes you are not dealing with cross comb i.e. comb that crosses between two frames. Instead, you simply have comb in strange places. This is a called burr comb. Again, this is not a problem for the bees but can create frustration for the beekeeper. Like cross comb, keep things neat and tidy and clean up burr comb early, rather than let it develop. Here’s a short video illustrating how simple this can be. Although not directly associated with cross comb, we have a quick point to make about fragile comb. Foundationless frames can create a real challenge, in terms of the fragility of the comb the bees build. With frames that have man-made plastic foundation, perhaps covered in beeswax, there is a certain rigidity to the foundation. However, when bees build their own comb, on a foundationless frame, the wax can be extremely fragile. This is a common and significant problem for new beekeepers not versed in how to handle a foundationless frame. Over time the comb will stiffen. But early on it is extremely easy to hold the frame at the wrong angle and have all that hard earned comb – and the contents – come crashing down. It’s a very sad moment, especially if you realize how much effort you bees have put into creating this masterpiece. Be very careful with how you handle fresh comb on a foundationless frame. It is very fragile and will take a while before it can withstand being held at any angle.